Sleek and agile, the long eared Plott Hound is a muscular streamlined dog. Plott Hounds have webbed toes and well muscled thighs. They have inquisitive eyes and their long tail is held high when they are excited. Plott Hounds originated in the US. Plott Hounds are 20 to 24 inches (51 to 61 cm). Plott Hounds 45 to 55 pounds (20 to 25 kg). Plott Hounds come in a variety of colors including various shades of brindle mixed with: yellow, buckskin, tan, brown, chocolate, liver, orange, red, light or dark gray, blue or Maltese, dilute black, and black. Solid black, any shade of brindle, with black saddle, and black with brindle trim. Also red fawn, sandy red, light cream, and yellow ochre, to dark fawn and golden tan. The short harsh coat of the Plott Hound requires weekly brushing. 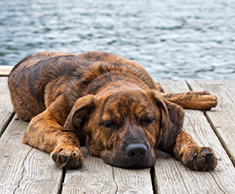 The Plott Hound's feet and coat should be checked after hunting for signs of tears, ripped nails or fleas. Eager to please, intelligent and willing, the Plott Hound was originally and is still bred as a hunting dog. This dexterous, determined and agile breed is loving and excellent with children. Plott Hounds drool and slobber but are extremely courageous and have a distinct high pitched bark. Plott Hounds should not be exercised right after eating a big meal. They are prone to gastric torsion and twisting of the stomach as they tend to eat very quickly. The Plott Hound's expected life span is about 12 to 14 years. Plott Hounds are bred for hunting and tracking and therefore are not suited for indoor life. They require plenty of exercise and may wander. This breed can sleep outdoors. Plott Hounds are in the Miscellaneous Class. Find Plott Hound Puppies with our Free Breeder search!